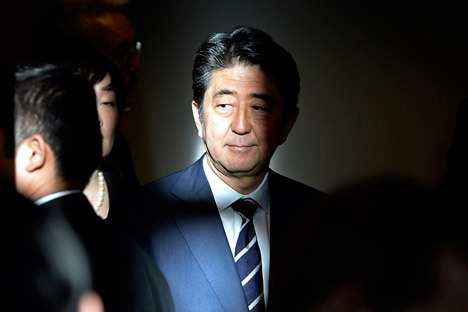 Japanese Prime Minister Shinzo Abe said he intends to continue negotiations with Russia to conclude a peace treaty and enhance cooperation in various fields on a bilateral level. “I propose through relentless dialogues to persistently continue negotiations to conclude a peace treaty and at the same time to enhance cooperation in economy, energy, security, culture and sports,” Abe said in comments that were read out at the third annual Russian–Japanese Forum on Cooperation in Business, Technology and Culture. “The development of good-neighborly relations with Russia is of great importance for the stability and prosperity of East Asia in the 21st century,” Abe said, while adding that Russia was an important neighbor. In his message, Abe also appreciated the importance of the Russian-Japanese Forum, which, in his opinion, has become a place where authoritative experts gather. “The upcoming frank joint discussion between them is of profound importance. I wholeheartedly hope that the Russian-Japanese forum will be a new step for the deepening of relations between Japan and Russia,” Abe said. Abe also spoke of the signing of Treaty of Shimoda in 1855, which led to diplomatic relations being established between Russia and Japan. "Over the 160 years that have passed since then, our countries have gone through various historical moments, developing and maintaining bilateral ties. Relations between our countries have great potential for development,” Abe said.